It's actually been a while since I've been this excited to see a movie opening night. The wait certainly didn't help either, having known about this movie for years now. 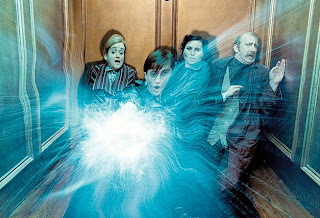 However, Harry Potter and the Deathly Hallows: Part 1 tiresome wait. I'm only on book 4 in series, so I have yet to compare the two, but as a movie lover, I highly enjoyed it. It was a tad frustrating as a stand alone movie... what should have been phenomenal was merely really good. It's without doubt a solid prequel for the chaos to come though. From the get go it's easy to see this movie is definitely the darkest, offering up more intensity and more thrills than it's predecessors. 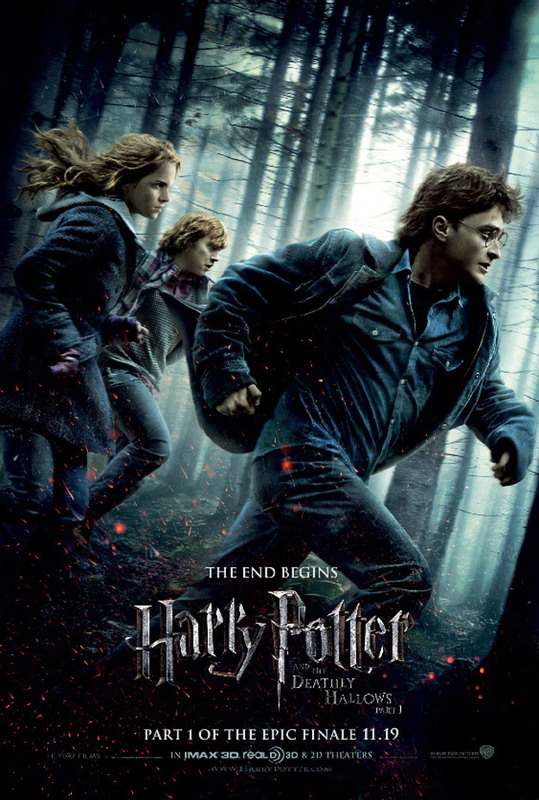 Rufus Scrimgeour (Bill Nighy) says it perfectly, “These are dark times, there is no denying.” Harry (Daniel Radcliffe) and his best friends, Ron (Rupert Grint) and Hermione (Emma Watson), are still grieving the death of their beloved headmaster, Albus Dumbledore. However, they literally have no time to grief. Lord Voldermort (Ralph Fiennes - who I just love btw) and his evil minion of dark wizards have taken over the wizarding world, casting heavy shadows on all things magical. And to top it off, The Dark Lord has his sights set on destroying Harry and will stop at nothing to see his will carried out. Play time is over! 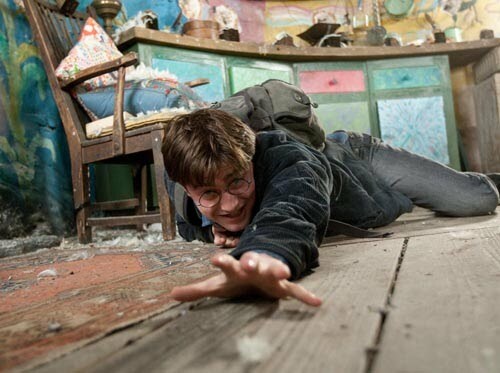 Harry is on the run for his life - he has become the hunted. I absolutely loved the look and feel of this movie. It was both dark and captivating and surprisingly rich in color. Director David Yates (who took over the franchise when it entered its dark phase in Harry Potter and the Order of The Phoenix) does his best work yet. The strong suits of Yates are his choreographed action scenes, and there are quite a few thrilling ones in this movie. Since the kids are now on the run, they have the opportunity to take us on a whole new adventure, where we see some of the most visually striking cinematography than ever before. And a movie wouldn't be complete with music. Alexandre Desplat does a fant astic job with this score. I absolutely love his work. Yeats does a wonderful job taking us away from the lighthearted children adventures and teen angst by throwing us into a terrifying dark world of adulthood. Each main character has their moment to shine, but what stood out the most was Emma Waston's performance. She shines as the troubled and resourceful strong young woman caught between her two best friends (She also finds time to control her eyebrows). The decision not to release the film in 3-D may have been due to production constraints, yet it’s a wise one nonetheless, one that makes me really happy. With the darkening of the images that occurs as a result of the process, it would have been nearly impossible to take in all the fine detail, because the movie is already extremely dark and shadowy to begin with. HP7 Part 1 was extremely entertaining. It definitely has me excited for the finial chapter, which hits theaters next year, July 15th 2011, although I'm sad at the same time. Sad, because this phenomenon is finally coming to and end. For more than a decade now, Harry has captivated worldwide audiences with all his thrilling adventures. Now the boy wizard, who is officially a young man, is at last ready for his final curtain call. Let's hear it, what did you think?